The San Luis Obispo County Coroner’s Office has identified Aaron Matthew Wolf as the man killed by an Amtrak train Saturday night near San Luis Obispo. 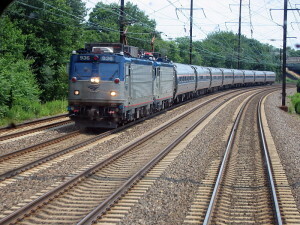 Wolf was one of three individuals who were struck and killed by trains on the Central Coast on three consecutive days. A train struck Wolf around 8:15 p.m. about a mile south of San Luis Obispo. The accident occurred east of Sweet Bay Lane, according to the San Luis Obispo County Sheriff’s Office. Emergency responders pronounced Wolf dead at the scene. Investigators have yet to determine the circumstance that led to the train hitting Wolf. An autopsy is scheduled to take place Wednesday. Wolf was reportedly in his 20s. Authorities also have yet to release Wolf’s age and city of residence. Pedestrians were also killed by Amtrak trains in Santa Barbara County on Friday afternoon and Sunday morning. A train struck a man around 4:30 p.m. Friday as it was approaching Lookout Park in Summerland. The man, who appeared to be in his 50s, was standing on the tracks and did not move as the train approached, according to the Santa Barbara County Sheriff Office. The conductor sounded the train’s horn repeatedly and conducted an emergency stop but did not manage to avoid the collision. Around 9:15 a.m. Sunday, a train killed a 19-year-old woman in Goleta below the Glen Annie/Storke Road overpass. Witness statements suggested the woman’s death was a suicide. What part of “Stay the hell off the tracks” do people not understand? Given the state of our education system, maybe they can’t read. Chances are good these are acts of suicide. SLO suicides are a direct result of living on the streets with no hope for unrestricted access to food and warm overnight shelter. Street people need untethered access to noontime hot meals served by People’s Kitchen (http://bit.ly/1Se3JXx) This organization is directly responsible for choosing to serve hot noontime meals at Prado where mischievous clients victimize others and the irresponsible Prado management responds by serving notices to all parties involved which deny these meals and services for 7, 30, and 180 days. This nonsense results in begging and crime in downtown SLO. Please help relocate People’s Kitchen. Proves us normal humans aren’t faster than a speeding bullet or more powerful than a locomotive. Next thing you know Jan Marx will be sponsoring a bill to hire a full time police force to monitor the tracks to prevent this tragedy from ever happening again. Maybe she could ride out of town on that rail. No surprises here. Quick, efficient, and hopefully relatively painless. Just wait until Jerry Brown’s fabulous Bullet Train becomes operational. If anything, it might at least somewhat reduce the number of “suicide-by-cop” incidents. Bullet trains we require background checks first. My Dad was a hogshead for the Southern Pacific on the West Coast in the 1940’s and 1950’s, and one of the reasons he gave for quitting driving trains was the number of people he killed, either accidents or suicides. Accidents happen, but cowardly,narcissistic suicides never think about the trauma they cause others, especially their families, and people like my Dad. Some religions say they go to Hell. I hope so.